In May 2015, Statens Serum Institut (SSI) detected another five cases of Listeria in Denmark. The five cases showed up in one week, which makes it unusual if there was only one source. The source of the cases is still undetermined; with deli meats being the most suspected, as it is the cause of last year’s outbreak. All five people had the underlying illnesses and two have died since. Listeria is one of the low-key food pathogen in Denmark, but it is considered to be one of the deadliest. The European Food Safety Authority (EFSA) declared that Listeriosis cases have increased by 8.6% between 2012 and 2013, and have been increasing for the past five years. Overall, the number of cases reported in Europe is low but the main concern would be the fact that each infection that occurred is the most severe and has the highest death rate. It seems that Listeria has been coming back to Denmark for the past 3 years. In September 2013, 5 people were diagnosed with Listeriosis and the case continued on until August 2014 where approximately 38 people were sickened and 15 deaths. This particular outbreak was considered to be the deadliest food pathogen outbreak in Denmark. 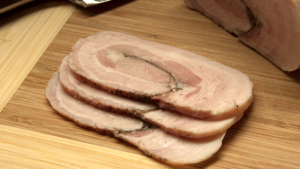 The main cause of this outbreak was the contaminated deli meat used to prepare Rullepoelse (picture above). The company that distributed the deli meat was shut down after the source traced back to them last year, but has reopen again this year. However, the Danish Veterinary and Food Administration (DVFA) have ruled out that company as the source of this year’s outbreak. SSI stated that two out of the five people infected with Listeriosis this year are infected by the same strain that caused last year’s outbreak. As of now, the SSI is still trying to trace back the source for the cases they’ve found and is trying to sample the possible food source that they could think of. They have not found any more new cases and are hoping to not have another outbreak just like last year. However, with the current number of cases, it is very difficult for them to figure out the source of Listeria. In order for the health agency to trace back the source of the contamination, they need an adequate amount of cases to easily determine the source. This is kind of an issue for Denmark where in one year they would only detect a small amount of cases, which they can’t use to find the source easily, and the case would continue the following year with a greater number of cases. It might be possible that in the near future, the department responsible for food safety can create a better sampling and detection technologies that could help them to trace the source of contamination with a small amount of cases available. With your knowledge about Listeria, what solutions would you suggest them? Would you think that better detecting and sampling technologies would make a big difference to the country? Comment below! Thank you for this blog post. It is interesting to compare the mortality rates of the same pathogen from different geographical areas– the mortality rate is much lower in the U.S. and in Canada as compared to Denmark. I wonder why? Perhaps it is because our health care system is better, or maybe our surveillance of pathogen is also more developed? I am assuming they are using a case-control study to identify the source of the outbreak –and the weaknesses of this source attribution method is evident in the Denmark outbreaks. I feel that people in Denmark should push the notion that high-risk people should avoid eating Category 1 foods all in all, although it limits the variety of the foods someone can consume. But, better safe than sorry right? Looking at the pathogen safety data sheets from PHAC, it is so interesting to note that outbreaks from Listeria Monocytogenes were from different food types in the past! For example, from vegetable products in the early 1980s, to dairy products in the mid 1980s and early 1990s, to ready-to-eat meat and poultry products in the late 1990s to early 2000s. How did that evolve?!?! Perhaps one of the solutions for this problem is to have better food production practices and more routine quality checks in the processing facility. It is better to improve the prevention strategies in the production plant than to work backwards to determine the cause only after the outbreak has happened. Nevertheless, it is still important to improve on pathogen detection methods to trace the source of Listeria before more people fall ill. It is definitely unfortunate to hear that the number of reported Listeriosis is increasing throughout the years in Denmark. What I find interesting though is that the cause of the outbreak is from the same strain of Listeria, but from different sources. This could possibly suggest that this particular strain has better survivability; hence, it’s able to survive, persist and cause subsequent outbreaks in Denmark. I agree with dgozali’s idea on focusing to better improve the prevention strategies. Rather than waiting and trying to work backwards to determine the cause, which will cost more time and more outbreaks to determine the answer, it is more practical focus on what can actually be done, prevention. It will be important for food manufacturing facilities to implement more strict sanitization and processing conditions to ensure the elimination of Listeria survival. At the same time, it will also be equally important to improve sampling and detection methods at the food production level to ensure that if Listeria is present, it can be readily detected and subsequently stop production to prevent the outbreak. If there were small outbreaks in two consecutive years of the same strain of Listeria, could the contamination been at a different level aside from the manufacturers? Perhaps there is something going on at the stores that sell the deli? I wonder what places they have checked for cross-contamination because if it is the same strain, there could likely be a common point of contact between all the deli meats involved. It is very surprising how Listeria is affecting Denmark compare to its influence on the US. From the outbreak investigation lecture we learnt that finding more cases is very critical since it helps us to understand more about the time frame, size and the source of contamination. I would say a better detection method will help the case a lot since it can help identify which food is being contaminated with Listeria and narrow down the suspecting food list.